Tagged with Canada, Cape Breton University, CBU, rental scams. 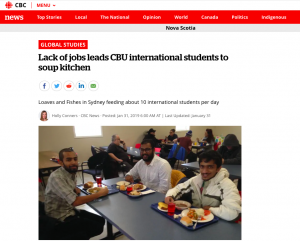 The unprecedented influx of international students choosing Canada as their study destination is having a worrying knock-on effect in certain provinces, with a lack of work forcing as many as 20 Cape Breton University international students to rely on a local soup kitchen for their meals. "We hired an off-campus housing coordinator under my management, and tasked this person with finding housing options"
The rapid growth in students is also causing problems finding enough available accommodation, although in the case of CBU it has responded quickly to this need. According to CBC, the problems began in September 2018 when CBU saw full-time undergraduate enrolment increase by 44% to 3,187, up from 2,213 the previous year. A further 500 international students enrolled at CBU in advance of the winter semester. In order to qualify for a Canadian student visa, applicants are required to prove that they have enough money to support themselves – at least CAN$10,000 for every year of their studies – and full-time students are permitted to work for up to 20 hours a week during term. However, some international students at CBU claim that due to a scarcity of part-time jobs in the area, they have already started dipping into their savings and are concerned about what will happen when they run out of money. As a result, the aptly named ‘Loaves and Fishes’ soup kitchen is feeding an average of 10 international students per day. But the kitchen’s general manager Marco Amati said he has seen as many as “18-20 that come in to eat”, several of which are Indian students who have been unable to find part-time work, and mothers with children. “I have applied a few places, but I couldn’t find [a job],” one student explained. According to IRCC figures, a total of 85,130 study permits became effective in Canada in the second quarter of 2018– up from 52,595 respectively in the same period in 2017, a 60% jump. And the explosive growth in international student numbers at CBU also led to a housing shortage in the area, with dozens arriving for the start of the fall semester without a place to live, leaving themselves vulnerable to rental scams and potential homelessness. CBU residence manager Doug Connors told The PIE News that the majority of these were international students from India who wanted to live downtown where opportunities for part-time jobs are greater. However, CBU appears to have been better prepared for the influx of international students that arrived in January 2019. “Recognising we had an immediate problem and opportunity to assist these students, we hired an off-campus housing coordinator under my management, and tasked this person with finding housing options and creating a searchable website for potential students and current students seeking housing,” Connors told The PIE. He said CBU put ads in the local paper and across social media to collect as many “spaces” as possible. As it stands now, CBU will collect, post and advertise, at no cost to the property owner, their rental properties to provide one source for our students to find appropriate housing that fits their needs and budget. “The other key piece was we invested more time and resources into the in-country education piece we provide to students prior to their departure from their home country,” he explained. Regarding rental scams in the area, which has left some international students as much as $250 out of pocket, Connors said that the university is doing what it can to help students avoid falling into similar traps. “We accept that we can not 100% insulate students from housing scams but we try to do our due diligence in checking the integrity of those that list with us and will remove any listing that is contrary to our expectations,” he added.